Once I finished up the new semi-solid colorways, I knew that I wanted a quick, easy project that included all of them. Doubling some naked MCN aran with a bit of each color produced a colorful, but not too-in-your-face, super-cozy cowl. I haven't done any measurements yet but it wraps up nicely in two layers. It's light yet will be nice and warm for the yucky winter months. 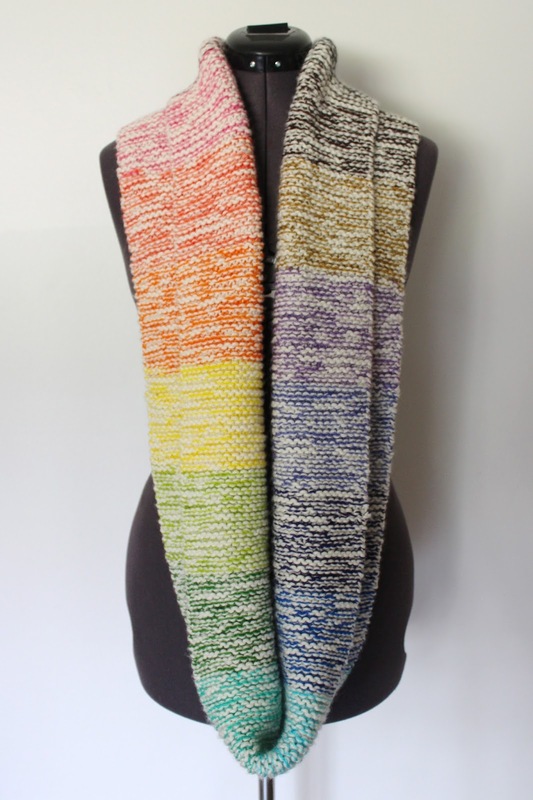 The garter stitch appeals to me since there's no curling and no wrong-side to deal with. It was an easy knit with just a bit of a challenge (in the tiniest sense) thrown in by way of a provisional cast-on and some kitchener stitch. If there's interest, I'd love to put together the pattern and maybe some yarn kits! I used three skeins of yarntini naked MCN aran and a very small amount of a mini-skein in each of the yarntini semi-solids. Could a beginner make this? yes, i'd love to buy the pattern and kit from you. Chrissy - Sorry for the late reply! Yes, I think this is great for a beginner. The main pattern is super simple. Just garter stitch with the two yarns held together. There are a couple of beginner/intermediate techniques used - kitchener stitch and a provisional cast-on - but if you didn't want to do those, you could just cast on normally and seam the two end together. i would love the pattern for this, but meanwhile how many stitches did you cast on?